A Fountain Hills Arizona Balloon Ride AZ is a must experience when staying in the Fountain Hills area, we have included some interesting background about the town below. When arranging your Fountain Hills Balloon Ride, be sure to check our directions page to see how convenient we are to the entire valley. Call us and you will see why Arizona Hot Air Balloons are so loved by the Fountain Hills Arizona community. Grab a spa day and then a Fountain Hills Arizona Balloon Ride today! With the beautiful McDowell Mountains as a backdrop the town of Fountain Hills, Arizona is the perfect place to visit or live. 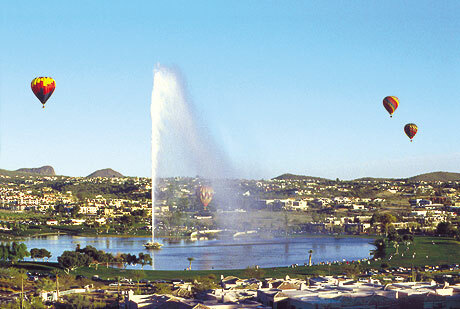 Not only cant you take a Fountain Hills Arizona balloon ride. There are a number of different amenities and activities offered by this scenic town, including several golf courses. Sun Ridge Canyon Golf Club is located on Sun Ridge Drive. 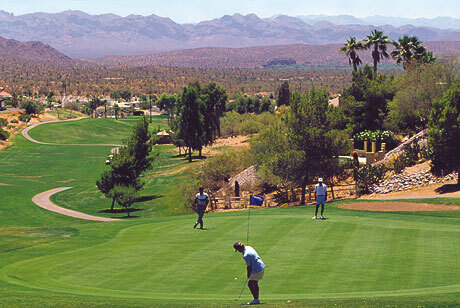 This Fountain Hills golf course is open to the public and comprises a 6,823 yard, par 71 course. Like each of the golf courses in Fountain Hills, Sun Ridge is a canyon type course that features numerous elevation changes. The feature hole on the Sun Ridge Canyon Golf Club course is #17, which is a 209 yard par 3 hole featuring divisional green as well as boulders standing at attention on both sides. Another great Fountain Hills golf course is Golf Club at Eagle Mountain. This course is also open to the public and was designed specifically for the purpose of including the natural canyon backdrops into the course. Golfers are able to enjoy a wide variety of elevation changes in this course as a result. In addition, golfers typically discover that the fairways on this course tend to be quite giving. This is an excellent course for amateurs as well as experienced golfers. 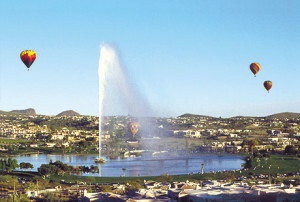 Desert Canyon Golf Club is a public course offering fabulous views of one of the largest fountains in the entire world. Regardless of which hole you happen to be playing you will be able to soak up views of this gorgeous fountain. Desert Canyon covers an impressive 6,415 yards and is a par 71 course that has been given a rating of 69. To make the course even better, the Southwest Pro/Am is held here annual at the beginning of every season. If you are of a mind to visit Fountain Hills in the near future, be sure to check with these golf courses about Fountain Hills golf packages in order to make the most of your visit. Everyone needs a little pampering every now and again and the number of beauty salons and spas in Fountain Hills will provide a variety of different treatments and services. There are a variety of beauty salons throughout Fountain Hills that will have you looking your best in no time. Along with these salons, there are spas that offer facials and other treatments for a little special pampering as well. If you are feeling a bit stressed out then you should consider services for massage and salons in Fountain Hills. Massage therapy has quickly become an accepted practice throughout the country and is now considered to be a great way to get rid of dangerous stress. Massage therapy services can also be a complimentary treatment along with other healthcare services as well. You can play a round of golf while you lady enjoys a spa day. Then meet up for a Fountain Hills Arizona balloon ride with Arizona Hot Air Balloons. You can call us at 1-480-282-8686 or as always our professional staff can build a package for your party. You can also fill out the simple reservation form to hold your day tentatively.